Pretty. I wish it didn’t have RED in it though. Overall I’m happy with it. 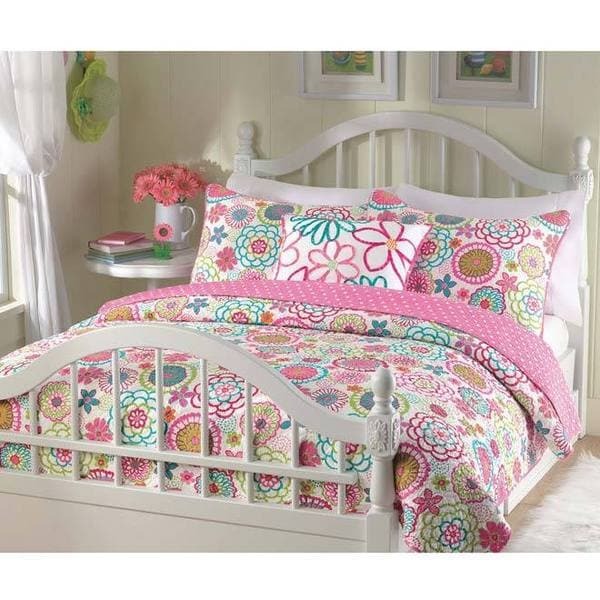 Bring fresh style to your child's bedroom decor with the vibrant colors of this beautiful quilt set. The set is crafted from a polyester-microfiber blend, decorated with a brilliant floral pattern that has been quilted all over for a warm and timeless design. The non-reversible quilt and matching shams (only one sham in twin set) are machine washable for easy care and convenience. Please note that for this model twin sets include only two pieces. We bought this quilt for out little girls graduation from crib to big girl bed. I took a chance as I usually go by others' reviews and there weren't any. The quilt is beautiful!! It's actually 100% cotton and washable which is great. I think the description says it's microfiber though? Regardless, the colors are vibrant, flowers on one side, pink with white polka dots on the other side. I didn't realize that but it's like getting two quilts in one! Love it and it will match with everything. It's a flat guilt, not filled with any stuffing, so keep that in mind. Great quality and value. Highly recommend!!! I am extremely happy with this quilt and sham. When I received it, I was pleasantly surprised at the bright colors. It was even prettier in person than it was on the website photo. My one concern was if it would hold up to many washings. As I was using it on my two year olds bed. I waited to write my review for that reason. I have washed it three times now (in cold water) and dried it in the dryer. It looks just as nice as it did when I first got it. I am very pleased with it. It does feel lighter than a comforter of course. We use another blanket under it for added warmth in the colder months. Got two twin sized sets for my girls' bunk beds for Christmas. These quilts are surprisingly soft and more beautiful than the pictures show. I'm very glad I chose this quilt set. It has a nice chunk of over hang on the side of the bed which is lovely for the bottom bunk, but a pain in the neck for the top bunk. Regardless, I love these sets. I feel like for the cost they are well worth it. I have washed one of the quilts once and I did so according to tag directions and it washed nicely and still looks perfect. I purchased this quilt for my six year old daughter. She loves it. The colors are bold and beautiful. It says in the description that there is red in it, there is not, it's hot pink, which is what I was hoping for. It fits on her twin bed nicely. (She has a fairly deep mattress.) The quilt is not very thick, but it's a quilt, it seems to be very warm though. Very happy with this product. i ordered the twin and it comes in 2 pieces. the quilt and sham. but by far the prettiest quilt set for my 10 year old daughters. this is a bright and busy quilt but we love it! My 6 year old picked it out. The quilting on it is done very well. great purchase. If i do remember the description said 4 pieces were included but it only had the 3 for a Twin set. Cute Quilt set for big girls! This quilt set is a great value. I got it for my daughter's room. It has a cute polka dot backing. The pattern is a little busy, so it needs to be broken up with some cute solid throw pillows, but we really like the colors. It's fairly good quality, especially for the price. I don't know how well it will hold up with several washings, but I think it should last for a while. We have a boutique with similar quality quilt sets for about 3 times the price! I'm very happy with this purchase. I have purchased bedding at this price point only to find it falling apart after the first wash, or made of fabric that could double as sandpaper in a pinch. This is not that bedding. The fabric itself is soft and crisp looking, and after the first wash there were no issues with bleeding and the quilting didn't start coming apart. The colors are bright and vibrant, and my child loves the flowers and polka dots. The quilt itself is on the thin side, but it feels fairly dense so I think I would be a good option for most temperatures. I would probably add another blanket during the coldest months, but I usually do that anyway. The one negative I found is that the pillow shams are a little difficult to put on fuller pillows. When putting on one of the shams I heard a stitch pop somewhere. Very cute quilt and sham set. We bought this for a little girl that loves pink! She was very happy. The quilt has vibrant colors and is of good quality. It has held up well after many washings. Adorable set... Came with queen quilt and two shams. Although I have not put them on my daughter's bed yet, its super cute, seems good quality for the price, very pleased!!! This is a really nice quilt set. My daughter did say that it is a little light so we use an extra cover (it's cold here right now), but it will be good for year round. I only wish that I could find the throw pillow that is shown in the picture. I did wash it and it did fine in the washer. I hung it to dry so it kept its shape well. Bought this for my daughters room, she absolutely loved this and it very well made quilt like material. Beautiful detail and great quality! I would suggest adding a down comforter with it to give it a more full look ! Bought this set for my daughter first "big girl" bed - it is adorable. Two years of use and it's still in great shape. I'd definitely recommend this set. Too cute! My daughter loves this and looks great in her room. Perfect for a young girls bedroom. Excellent quality! My kids love it! bought this for my 2 year olds room----she is soooo excited for her big girl room and loves the pattern! I do too!! awesome buy!! I love the colors of this set! We bought this for my daughter’s room when we switched from nursery to big girl room. Comfortable and durable! We use all year round just by throwing a duvet underneath. Bright colors and very girly. My granddaughter loves it. Has been washed several times now and is still very vibrant. Wash, dry, back on the bed - fits the same every time and is not wrinkled. "The description says the quilt is not reversible, while the picture clearly shows a pink polka dot pattern on the other side. Is the quilt reversible to the pink polka dot?" "Do you have to purchase an insert for the sham or does it come with the sham for the queen set?" This does not include an insert for the shams. "Are there window treatments that match or coordinate without purchasing a solid color? Perhaps polka-dots or matching flower pattern?" No, there are no window treatment to match this. "Is there any purple in the quilt?" No purple in this quilt but I bought it to go in my daughters purple bedroom and it looks great! There are two shades of pink which almost make it seem like it's purple. "Will this bedding fit a twin xl or should I purchase the queen set?" This set is designed to fit a standard twin size bed. A TwinXL mattress measures 80 inches long whereas a twin mattress measures 75 inches long. The Twin quilt measures approximately 68 inches wide x 86 inches long. "Is the blue color more like the first picture, or a brighter blue like the other pics?" It's more of a dark teal color. It's more like the 1st photo. I would say a teal blue. I ordered this set hoping for teal but it is aqua. This is not teal at all! "Are the pillow shams standard or euro?" They are standard size but the quilt is truly excellent quality and washes well! My great niece loves it!